Brake or no brake? That is often one of the questions when you are trying to decide upon the best balance bike for you and your child! The purpose of balance bikes is to help children learn to ride, balance and steer before they graduate to larger, heavier pedal bikes. Balance bikes are lightweight, easy to transport and maintain so they are the perfect introduction to cycling. The natural way for children to stop themselves on a balance bike is to put their feet on the floor, and this will also happen if they find they are losing their balance to stop them from falling. This means that there often is not the need for a brake on balance bikes, especially bikes for younger children aged from 18 months – 3 years. Children of this age also lack the ability and don’t have big enough hands to use a brake, so many of the smaller models will come without one as it is not necessary. As your child becomes a more confident rider, then it is worth considering buying a balance bike with a brake or fitting a brake to their existing bike. A confident rider can gain a decent amount of speed, especially if they are going downhill so it would be useful to have a brake in these situations where it is not practical to use their feet to stop. Another argument for buying a balance bike with a brake is that this will help children with the transition from a balance bike to a normal pedal bike, that will be fitted with a brake. It can be difficult for children to change their habits if they are used to stopping themselves with their feet, and it can be dangerous to be dragging your feet along when riding a pedal bike. A good example of brakes on balance bikes is to look at the Puky range of bikes. 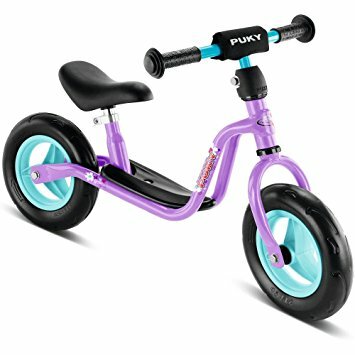 Puky offer several models of balance bikes in their range, and the smallest two models are the Puky LRM Learner bike and the LR1L Learner bike. The Puky LRM model (pictured) is aimed at the youngest children aged 2 and upwards, and does not come with any sort of brake as it would not be used. The LR1L bike has the option of a rear drum brake, and the largest model in their range is the Puky LR XL Learner bike, aimed at older children and comes equipped with a rear V-brake. Although the presence of a brake on your balance bike is another factor to consider when choosing the right bike for your child, there are more important aspects to think about including the style, colour and most importantly the right size. It is vital that you choose a bike that is the correct size for your child or they will be very reluctant to use it. This is the single most important factor to think about when looking through the balance bikes available and we have reviewed this point in detail in our balance bike saddle height guide. We also have guides to the best balance bikes for 2 year olds, 3 year olds, 4 year olds and older children aged 6 or above. Whichever bike you choose for your child, make sure they have fun and get on their bike!